11 Jane Street Rendering. Image Credit: David Chipperfield Architects. Proposal met with strong opposition from community members, elected officials and preservationist organizations. 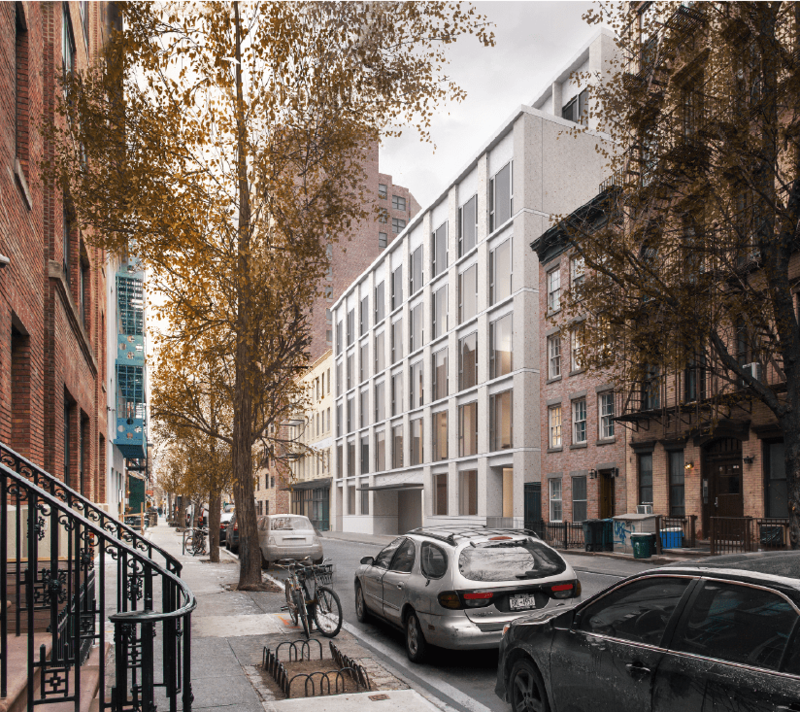 On June 21, 2016, the Landmarks Preservation Commission considered and heard testimony on an application to replace a 1921 garage building with a new residential structure at 11-19 Jane Street. The site lies within the Greenwich Village Historic District. The garage at the site is two stories tall, and it once replaced two townhouses. Consultant Ward Dennis, of Higgins Quasebarth and Partners, introduced the presentation. Dennis said the 1920 garage was described as an “intruder” to the district in the designation report, and that the neighborhood had a history of residential architecture. He said the block is home to a variety of building types of differing heights, including residences, commercial warehouses, and former stables. The building would host apartments, a below-grade garage, and a multi-story 1-family residence with a separate entrance referred to as a “maisonette.” Chipperfield said the new building would better engage pedestrians at the street level than the existing garage. Over two dozen area residents testified at the hearing to oppose the project, criticizing the massing, the design, the loss of the garage, and the potential impact on street traffic. Chair Meenakshi Srinivasan stated that Manhattan Community Board 2 had recommended that the application be denied, and that the Commission had received many letters in opposition. Chipperfield said looming towers already served as a backdrop to the south side of Jane Street, and the impression of the building’s size from pedestrian perspective would be the 60-foor streetwall, which he said was in scale with the rest of Jane Street. Commissioner Adi Shamir-Baron commented that she would like to see an option that incorporated the existing garage building. The hearing having extended past the meeting’s scheduled end time, Srinivasan moved to close the meeting, and lay over further discussion of the proposal to a later date. LPC: 11-19 Jane Street, Manhattan (18-5336) (June 21, 2016) (Architects: David Chipperfield Architects). My impression of the proposed building style, next its neighboring brick facades, is that it is very colorless, flat and institutional-looking, boring, lacking texture, variable forms or eye appeal. Reuse the current structure, start over with some real artistic talent, or give it up!